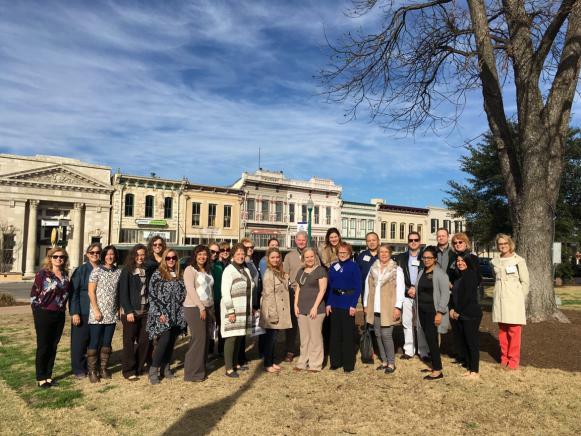 Along with five local Main Street enthusiasts, Linden’s new Main Street Manager Allie Anderson attended the invitational Texas Main Street Training 2017, held in historic Georgetown on January 24 and 25. Participating in these excellent training sessions were Linden Main Street Manager Allie Anderson and supporting volunteers Anna Dewell-Eddings, Ruth Halleck, Catherine Knapp, Sue Lazara, and Joe Lovelace. Others invited for the training were representatives of the City of Buda, also entering the program in 2017, and a small number of other Texas cities with new Main Street staff and/or volunteer leadership. Linden representatives were impressed with the professionalism of the Texas Main Street Program staff and left Georgetown more excited than ever about the future potential of our own special, historic downtown. Organization: Community partnerships lead to even more successful preservation-based revitalization. Design: Guided by a town’s own unique physical assets and local heritage, the design staff produces professional solutions geared to an active district that maintains authenticity. Economic Vitality: Identify new market opportunities for the commercial district, find new uses for historic commercial buildings, and stimulate investment. Promotion: Marketing activities are built around a unified, quality image of the business district as the center of activities, goods and services. Texas Main Street communities range in population from 2,000 to over 300,000. As a group, these 80+ cities have added about 35,000 jobs and 8,700 new small businesses to the Texas economy – reporting also more than $3.2 billion of overall reinvestment, most of it privately funded. NEXT STEPS: The Linden Main Street Advisory Board is forming committees and inviting broad community participation in those committees. Local Manager Allie Anderson will lead a local Advisory Board Training program on January 31 to review and reinforce some of the key learning from the Georgetown sessions. Finally, late next month, State Main Street Coordinator Debra Drescher and a team of her key staff will be spending a few days in downtown Linden, working toward an individualized Plan of Action for our local Main Street program and downtown development. Like the Georgetown training, this personalized assistance is given at no charge now that Linden is a designated Texas Main Street City. Next > SAVE THE DATE: Old Macedonia Cemetery – Saturday, February 18th @ 8 a.m.